Have you ever had a day you wish you could just do-over? On tough days, I try to keep in mind that I’m the parent, and I cannot expect my children to act like mini-adults. Especially if they are tired or hungry. Today, though, all that went out the window. My boys got up too early, after being up late the night before. (They had a hard time going to sleep because I was out at bedtime. I went the “Annual Parent-Teacher Meeting” at my older son’s new preschool. I was the only parent who showed up. Out of the entire school.) I was grumpy at breakfast, snapping when my boys crowded around me, hugging onto my knees, making it difficult for me to get their oatmeal ready. It went downhill from there. We were all still in pajamas when the cable guy came to install our cable box. My younger son threw an ornament decorated by my older son, shattering it. I decided today was the day we cleaned out the toy room, and I grew impatient when my older son didn’t want to donate anything, and wouldn’t throw out even broken toys. My 16 month old’s nap-time was a total disaster. I yelled at my older son when he repeatedly woke up his little brother. I kept doing it, knowing that he was 4, and tired, and by this point, hungry again. I knew that the situation was not going to get better by me yelling. I yelled anyway. Repeatedly. I could see in his eyes he was surprised by my reaction. I hate that I put that look in his eyes. Now that the day’s over, and I think back over it, I wish I had gotten more sleep, or put myself into his shoes more, or counted to 10 before saying anything. Really that I had done anything other than my actual reaction. Unfortunately, there are no do-overs in parenting. I can’t change how today went. All I can do is forgive myself, remember this, and try to dig a little deeper in myself next time. When I wrote this, I did not intend to post it. Truthfully, I was going to post about easy, kid-made Christmas decorations. Sometimes I write things like this, for which I am not sure I have an audience, just because I want to get it out, and they remain as drafts. But this week, I had a few comments from people who said that my website makes parenting look easy. It’s not. Parenting is not easy. At least not for me. For me to be at my best, I need to be present, look at the situation from my children’s perspective, and each situation in the most positive light possible. Honestly, being well-rested and not checking my phone are also key. I’m not saying my best is perfect – it’s just my best. 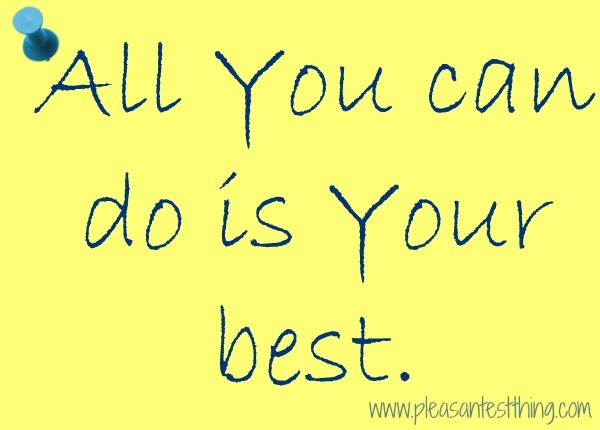 All any of us can do is our best. Hopefully my best will be visible tomorrow.